Here is week 5 of our Keto Diet Meal Plan. 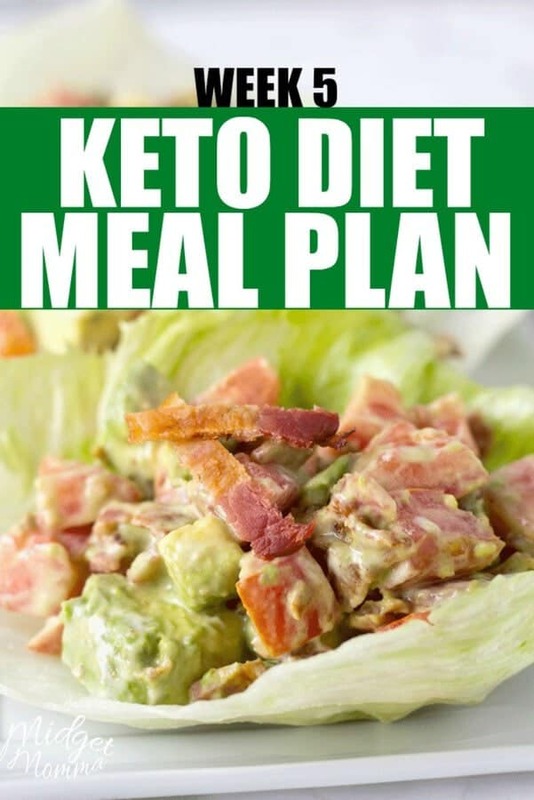 I do this Keto Diet Meal Plan each week to help you with planning your keto and low carb meals for the week. This Keto Diet Meal Plan is designed to help you plan your meals and have less stress. I know at times it can be hard to plan and when it is hard to plan it is hard to stick to a way of eating. Personally I have coffee for breakfast, either Keto Coffee or Bulletproof Coffee most days. I have included breakfast ideas for you as well for those of you who do eat breakfast in the mornings. This week I am making a big batch of taco meat, using homemade taco seasoning so I can have Taco Salads for lunch for the week. Each day I can change up my salad to what toppings I want on it, but having the taco meat already done will make my life a whole lot easier during the week. Breakfast: Hardboiled eggs, which i will make hardboiled eggs in oven, with bacon or sausage depending on my mood, and strawberries. Dinner: Barbacoa Burrito Bowls (The rest of the house will have burritos and I will skip the tortilla) with toppings for everyone to make their own and homemade guacamole. Dinner: Chicken Broccoli Alfredo with Salad. Breakfast: Hardboiled eggs, which i will make hardboiled eggs in oven, with bacon or sausage depending on my mood and blueberries. Lunch: Lunchmeat Rollups, while the rest of the house has sandwiches. Dinner: My favorite Shrimp Alfredo for the family and I will have Shrimp Alfredo over Zoodles along with salad, which uses my favorite Alfredo Sauce Recipe! Looking for more Keto Diet Meal Plans? Check out the previous weeks!